Kari Spencer at the Micro Farm. Courtesy of Kari Spencer. Kari Spencer has been smitten with farming since she spied her grandfather’s Midwestern garden when she was a little girl. But when Spencer grew up — and found herself in the middle of a desert — she knew she was going to have to invest in some training to successfully tend plants (and eventually animals) in the dry, Phoenix, Arizona climate. But that’s just what she did, and since learning those valuable desert gardening skills, she’s successfully built an urban farm oasis: The Micro Farm Project. Seedstock recently interviewed Spencer to find out how she learned her desert gardening skills, her experiences as a female farmer and more. Seedstock: What sparked your interest in farming? Spencer: When I was a kid, I was fascinated by my grandfather’s garden, and I always wanted to be a gardener. But I didn’t know how to grow anything successfully in Phoenix. I took the Master Gardener program at the Maricopa County Extension office and learned to grow in the desert. Through my association with the Master Gardeners, I rubbed shoulders with people who not only grew vegetables, but also had chickens, goats, and other livestock animals in our urban environment. The idea appealed to me, not only to grow food, but also to have fresh eggs and animals raised in our yard. Seedstock: What skills did you learn in the Master Gardener program? Spencer: Not only did I learn from the lectures and the readings, but also by working in their demonstration garden and networking with other gardeners who had more experience than I had. I also took classes and tours through the Valley Permaculture Alliance and from Greg Peterson of The Urban Farm. At the time, there were not a lot of resources available, so most of my knowledge has been gained by experience. Seedstock: Are there a lot of resources for female farmers in the Phoenix area? Spencer: The urban farming community in Phoenix is very diverse, and there are a lot of female farmers. Within our personal circle of farm friends, more than half are women. Some of these ladies are single, and others farm with their spouses. In the case of spouses farming together, most of their operations were started and are primarily maintained by the women. Seedstock: You founded and started this farm on your own while your husband was away. What roadblocks did you run into? Spencer: The farm was started while my husband was deployed with the Navy Reserve.Since Lewis was away, and I am a small woman, I had to spend some money hiring labor to do most of the heavy lifting. I completely renovated the landscaping in the backyard and had to manage contractors who helped me with irrigation box and hardscapes. This was costly, as well as time-consuming. Fortunately, I had some good friends who helped me with running irrigation lines and planting. The biggest issue that I had was getting farm education. I took advantage of the few programs that were available at the time, but most of them had a focus on gardening, and were not farm related. As a result, I made a lot of mistakes and spent a lot of money. Seedstock: Do you find any advantages in being a female farmer? Spencer: There are advantages to being a female farmer. 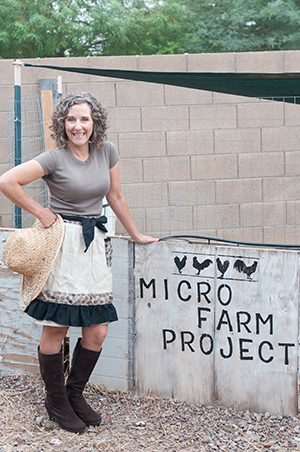 Many programs and grants exist for female farmers and business owners, offered by the City of Phoenix, the Small Business Alliance, the USDA, and other groups. But the biggest advantage is the camaraderie amongst female farmers. Since we tend to be social, female farmers are constantly sharing information, labor, and moral support with each other. This occurs at seed exchanges and events, on social media, in small groups, and one-on-one. I have found most farmers to be willing to help each other out, especially the ladies. And I have developed a really great group of friends and acquaintances through farming connections. I have not personally experienced any barriers or problems due to being a female farmer in Arizona. Women have been well received and accepted into the local farming community and they are spearheading many of the programs and resources that are becoming available to farmers. The Phoenix area has a vibrant, growing farm community that is made up of people from all walks of life. All of the farmers with whom we rub shoulders are really willing to help each other out, and everyone is welcome. It’s really amazing to see people from both sides of the political aisle, from various countries and backgrounds, and who would otherwise not have much in common gathering together to support each other’s farming endeavors.